If you're all about relaxed dressing when it comes to your personal style, you'll love this extra adorable pairing of a black fluffy crew-neck sweater and Drome leather leggings. Rocking a pair of black leather lace-up ankle boots is a simple way to add extra flair to your look. We all getup for comfort when it comes to dressing up, and this combination of a brown fur vest and black leather leggings is an amazing example of that. Bring a touch of sophistication to your outfit with black leather ankle boots. If you're after a casual yet absolutely chic outfit, consider teaming a black leather coat with Drome leather leggings. Both items are totally comfy and will look fabulous paired together. When it comes to shoes, this look is round off wonderfully with black suede desert boots. Team a mint biker jacket with Drome leather leggings, if you want to dress for comfort without looking like you don't care. To add oomph to your look, complete with white leather pumps. This combination of a red coat and Drome leather leggings is super easy to throw together and so comfortable to wear as well! You could perhaps get a little creative when it comes to footwear and lift up your look with red leather pumps. If you're looking for a casual yet stylish ensemble, go for a dark green trenchcoat and black leather leggings. Both garments are totally comfy and will look fabulous paired together. For something more on the daring side to round off this outfit, grab a pair of black and white low top sneakers. If you're scouting for a casual yet absolutely chic outfit, dress in a hot pink coat and black leather leggings. Both pieces are totally comfy and will look fabulous together. Bump up the cool of your getup by complementing it with black suede knee high boots. 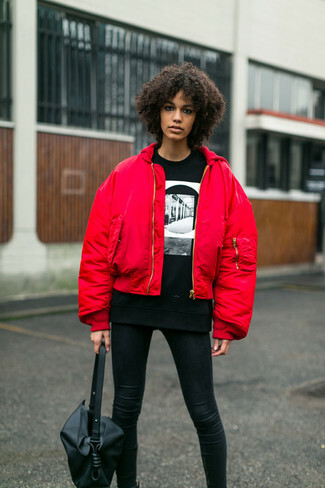 If you're a fan of relaxed dressing when it comes to your personal style, you'll love this chic pairing of a red bomber jacket and black leather leggings. Consider teaming an olive parka with Drome leather leggings from farfetch.com for a comfy-casual look. Add a glam twist to your outfit with olive suede ankle boots.